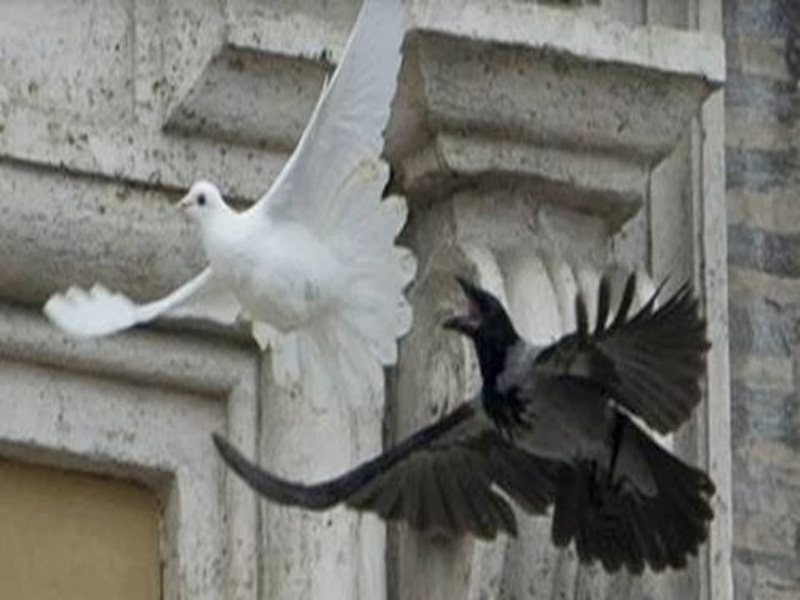 Two white doves were released as a peace gesture by Pope Francis, but a large black crow and a seagull immediately went in for the kill when the doves were set free. People saw the event as a harbinger of dark times to come. And it is not first time it happened. Exactly the same fate was dealt to a dove released by Pope Benedict XVI almost a year to the day on Jan. 27, 2013. On 11 February 2013, Benedict announced his resignation and his resignation became effective on 28 February 2013. On January 30, 2005, Pope John Paul II had to actually shoo a dove out of his apartment window, the bird flew back into his room overlooking St. Peter’s Square. Pope John Paul II died a few months later, on April 2, 2005. Guess what people... the church is a sham, the dark times have been upon us. This meaningless symbolic gesture of releasing a dove is absurd. The crow is here to remind us of this. It brings magic and truth, not bad omens. The dove is symbolic and absurd? But the crow is a good thing symbolic but not absurd! What some people think, just because you don't like the church. You misunderstand me. I understand the symbolism. I just don't agree on how it's perceived. Animals are archetypal, and perceived differently depending on location, culture, and many other things. The absurdity of symbolism I'm referring too has to do with the church, and all of its blasphemy, contradiction, dogma, mind control, love of money, pedophilia, etc. I'm sorry if that offends you. I understand the ravens, doves, dogs, cats and animals more than I understand people. Crows and seagulls do Not get along well. they compete and scavenge for the same food. They can be very territorial to one another in this capacity. More so the crows. They did not attack one another, yet they were close enough on hand to have Two birds which would attack two doves, within seconds. In my opinion, this was staged. The gull and the crow were raised together in the same environment and familiar with each other. I will even go so far as to suggest they were trained to attack doves. This is a terribly easy thing to accomplish. This is my opinion, and I am allowed to have it.